Day-to-day transactions like receiving payments from customers or paying vendors occur so frequently that most QuickBooks users do them automatically. However, from time to time you may encounter an infrequent transaction that will stop you in your tracks. In this article we’ll discuss several common tricky transactions and offer advice on how to handle them. Choose Lists, and then Chart of Accounts (or press Ctrl-A). Click the Account button, and then choose New (or press Ctrl-N). 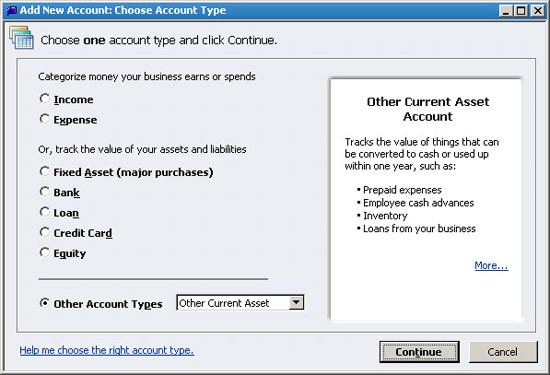 As shown in Figure 1, choose Other Account Type, Other Current Asset, and then click Continue. 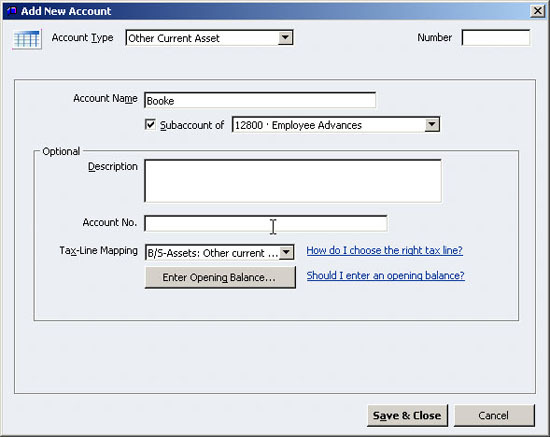 Assign an Account Name such as Contributions from Owner, (and account number if applicable). If necessary, click Subaccount Of, and specify the Deposits account. Click Save and Close to save the new account. Figure 1: An easy way to manage security deposits is to post them to a new Other Current Asset account. Choose Banking, and then Make Deposits. Specify the vendor, and then choose the account. In the case of deposit refunds, you should have an asset account that you’ll apply the money against, as shown in Figure 2. For other types of refunds, use the expense account from which you originally paid the money. Figure 2: Apply utility deposit refunds back to the deposit account on your balance sheet. This is a situation where an owner of the company invests money into the firm. The owner does so in hopes of making a return on their investment, but does not have a specific timetable in mind for repayment of the loan. If you don’t already have a Contributions from Owner account, follow these steps described previously for creating a new account, but choose Equity and name the accountContributions from Owner. Distributions allow an owner to take profits out of the company on a non-salary basis. Distributions can be paid through payroll or on a separate check. Your chart of accounts should already include a Distributions to Owner account, but if it doesn’t, you can establish this new Equity account, which you can then use in either of these types of transactions. 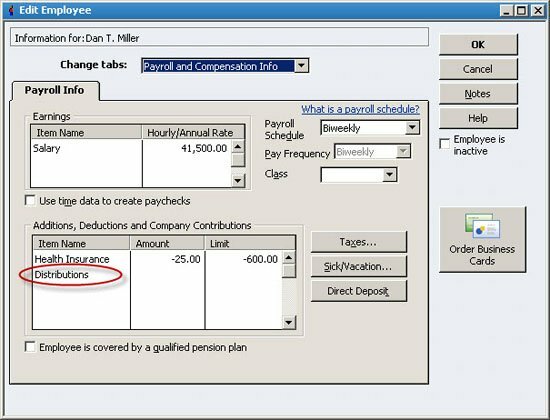 Choose Employees, Manage Payroll Items, and then New Payroll Item. Choose Custom Setup, and then click Next. Choose Addition, and then click Next. Enter the word Distribution and then click Next. Choose the Distributions to Owner account from your chart of accounts, and then click Next. Choose None for the Tax Tracking type, and then click Next. Leave all of the taxes unselected, and then click Next. Choose Calculate This Item Based on Quantity and then click Next when the Calculate Based on Quantity screen appears. Accept the default choice of Gross Pay and then click Next. Leave the Default Rate and Limit fields at zero and then click Finish. Next, select the employee in the Employee Center, and then choose Edit Employee. Choose Payroll and Compensation Info from the Change Tabs list, and then add Distributions to the Additions, Deductions, and Company Contributions list, as shown in Figure 3. You can fill in the distribution amount now if you know the ongoing amount, or you can fill it in on the fly during the payroll process. 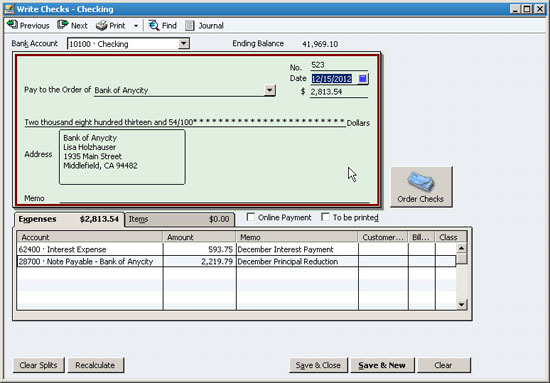 Simply display the Paycheck Detail during the payroll process to access this field and enter the distribution amount. Figure 3: Add Distributions to the Additions, Deductions, and Company Contributions section. 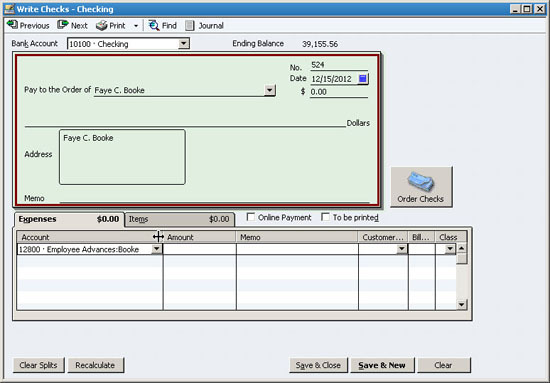 Separate check: A much simpler approach is to write a separate check to the owner. To do so, choose Banking, and then Write Checks. Choose the Distributions to Owner account and fill in the amount. From time to time the owner may need to make a loan to the company. If the owner expects this money to be repaid, establish a Loanaccount on the chart of accounts and record the deposit of the loan to this new account. Sometimes your company may make a salary advance to an employee, or the firm may loan money to an affiliate. In such cases it’s important to always establish a separate Current Asset account for such transactions so that you can easily track the outstanding balance. Such accounts can be a subaccount of a general Loans Receivable account, as shown in Figure 4. As shown in Figure 5, you’ll code the check to that subaccount. 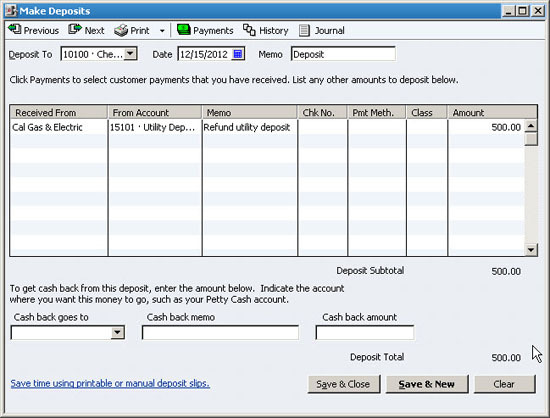 Figure 4: Make sure to create individual subaccounts for loans to employees or other parties. Figure 5: Be sure to use the proper subaccount when issuing an employee loan. Interest only payment: In this case there’s only one account to charge, which will be Interest Expense, as shown in Figure 6. Extra principal payment: Extra principal payments being submitted on a separate check should be applied directly to the Loan account. Figure 6: Interest-only loan payments post directly to the Interest Expense account. Figure 7: Make sure to break out principal and interest when a loan payment reduces the outstanding balance. Expert tip: You can use the QuickBooks Account Reconciliation feature to reconcile your loan balance with the periodic statement that you receive from your lender. This ensures that your financial statements are correct, and helps you confirm that the lender is applying your principal payments correctly. In QuickBooks, you would choose Banking, Write Checks, and then write another check to Cash, and code it to the corresponding expense accounts for the three purchases. Expert tip: Petty cash is easily subjected to abuse, so be sure to require receipts for all petty cash transactions.